Harper's Gigi sent me a beautiful mum yesterday and Harper this talking, snoring pig as get well gifts since we had the "swine flu". Harper loved playing with the pig. Now that Harper is all better - I finally took some pictures of her in her Halloween costume. I hate that we missed her first Halloween but I'm pretty sure she doesn't know she missed it. ha! We will have fun next year. I think she is just the cutest little pig! She wasn't overly excited to be having her picture made in her costume. I feel like I have officially moved on from baby to toddler. She is keeping me SO busy every day. She is EVERYWHERE! She crawls all over the house constantly and I spend most of my day saying "No Harper" and diverting her from danger. She is starting to stand on her own and I tried to snap a picture of her today when she was doing it. She only stays up for a few seconds like this but it's getting a little more every day. I'm sure in another month or so I'll have a walker and then I might die from sheer exhaustion. ha! I was thinking today of how I spend most of my day with Harper wanting to do the one or two things that I have to tell her "No" about. (i.e. - going out the doggie door or pulling up on something sharp). She has an entire room or rooms of good things to play with and do - lots of fun toys, lots of safe places to stand and yet the only thing she wants is the one thing I tell her she can't have. She cries and turns red and rears her back and throws tantrums every time I tell her no and I try to patiently steer her towards something better. Isn't that such a picture of us and God? We ask over and over and over and over for the one thing God tells us No on and He gently tries to redirect us. I wonder sometimes if he ever loses his patience with us or gets tired of trying to keep us from hurting ourselves? I have a feeling I come off like a very spoiled and fussy child most of the time with Him. Thank goodness that His grace and mercy is new EVERY morning! That is the most adorable baby pig! She looks SO cute!!! What a doll. Make it easier on yourself and uber baby proof any room she has access too. I had gates and not a picture frame or nick nack in sight for years! It makes it a lot easier as she can wander and you don't have to be on top of her. It's exhausting! what a great connection to God. i think you are SO right. i need to remind myself of this a lot more often! That costume is too adorable! Your analogy is right on too. I'm thankful for His mercy and patience. Such a precious pig!! I have never seen a costume like that before. It's way cute!! Thanks for the picture of us and God. That is a wonderful comparison. It really puts things into perspective. Cutest little piggy I ever did see!!!!!!!! Oh my gosh she is so sweet. By the way, I blogged about some amazing cookies today that I think you will love. Check them out over at my blog. The idea of her trying to go out the doggie door makes me laugh!!! Harper looks adorable in her costume, and I agree with you that she probably doesn't know what she missed out on! I loved the way you ended today's post...such food for thought! LOVE the little piggy! She's so cute! I know all about what you are talking about with the sheer exhaustion! Colten is ALL over the place and has been taking steps here and there for a couple of weeks now. He's quite the climber as well...he's doing so much more at this age than my first one did! And to think I thought my first one was early with some things...this one is going to be (or already is!) a handful! Ok, that is the CUTEST halloween costume ever! Can I ask where you got it? LOVE the costume! So glad you girls are better! I must ask what you are planning for her first birthday? I know it will be ferosh! That little Harper is too cute! I love the costume and her pink shirt in the first picture. Harper looks adorable! And I am in full agreeance with your post. I know that I must seemed spoiled to Him as well. Goodness. :) Thankfully, we serve such an awesome God! my best friends daughter wore that same costume and it was just adorable! GREAT pick!!! Isn't that just the truth? I love that picture of how we must come off to God. Thanks for the sweet reminder of how many gifts I actually have instead of focusing on the two things I don't have. Harper is incredibly cute. These days will end all too soon and you will wish you were chasing her around again. My son just turned 9and I find myself wishing I could have it back for just a few days. They were fun days, hard days and exhausting days, but very worth it. She is the cutest pig I've ever seen! You are so right! Having kids has taught me so much about God as my Father and me as His child. SOOO many lessons to learn! Great post! And Harper is just too cute! Harper looks adorable in her piggy costume! we sure do have minds of our own! sometimes we have to fall and hurt ourselves to be able to learn. it is our ugly human nature, but that is the way it is. until we experience the pain, we will not learn. Praise the Lord...she is healthy and active like we prayed her to be! You (Mama) will make it thru all this activity. You are young and vibrant and able to do it. She does make a very adorable pig! Well said. Thanks for the reminder. That piggy costume is so adorable. My granddaughter is 15 months old and it is totally exhausting chasing her all day, but totally worth it! Such a dollbaby! That costume is precious! And the irony is not lost that her first Halloween in the darling piggy outfit got derailed by the Swine flu! She is growing so fast...it doesn't ever slow down! Awesome explaination of God and us! Wow I needed that today !! SHe is the cutest little pig ever!!! Hope you all are feeling better!! I love Harper's piggy costume! how cute!! My daughter is almost 9 1/2 months and she's doing everything that Harper's doing. I almost thought you were writing about my baby girl there for a second. :) My daughter also is crawling around ninety miles an hour and she just started standing up in the last several days... she'll stand for several seconds before she falls. Like Harper she also has a house full of toys yet she always wants whatever she can't have - usually my laptop or electrical cords! And I'm always having to tell her NO too. So the obvious - that costume is adorable & so unique ... where is it from?? And what are the chances that you had a piggy costume when she had the swine flu!?! Great analogy & unfortunately so very true!! So true! I too am thankful His mercies are new every morning...especially as a mom. My daughter is 15 months and drives me crazy sometimes. She is at the stage where she is testing her boundaries and often tests the SAME boundary over and over again. It's exhausting...but I'm SO thankful to be her mommy no matter what! Your Harper is just cuter every day! oh my goodness, that costume is ADORABLE!!!! Harper is a darlin' little pig! She is the cutest little Piggy! Thank goodness you both are better! I agree with you on how we have such an amazing God! His mercies are new every single morning! He is such a giving and loving God! What a cute little piggy you have there! She's precious! I totally agree with you on us being like spoiled little kids to God... but just like you never stop loving Harper no matter how many times you tell her no on something, God loves us more than we could ever ask or imagine. THANK YOU LORD FOR YOUR GRACE AND MERCY!!! WE WILL NEVER DESERVE THE LOVE YOU GIVE US!!! We serve an awesome God don't we! Thanks again for being such a blessing Kelly! I look forward to hearing what you have to say everyday! May God Bless you as you are a blessing to others! That deserves a huge AMEN! Harper is a precious little piggy! Love seeing pics of Harper! Glad you both are feeling better. 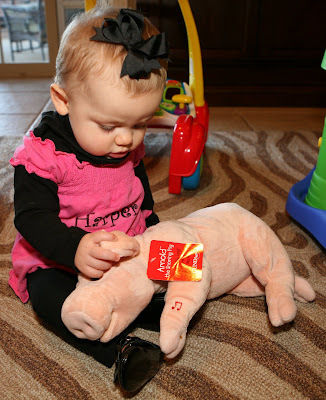 One of my favorite bloggers, Annie - at Dumptrucks, Babies, and Everything Else - had that same piggy costume for her precious daughter Annabelle. I literally squealed when I first saw that costume...I think that is the cutest thing I've ever seen! Amen! I've thought of that analogy before, too. Such patience and love our Father has for us. Harper IS the cutest pig ever! Where on earth did you find that adorable costume? Her costume is so precious, how appropriate that she was a little pig!!! :) I am glad to hear that both of you are getting better, I am paranoid about getting the swine flu and hearing that you are already over it is great, great news. God is good!!!! Take care. Oh my goodness..that is the cutest piggie I have EVER seen! I remember those days very well. It can definitely be a challenge. That's when I finally gave in and gates flew up all over my house. (And they add nothing to the decor) My son was given a shirt that said "I think my name is No-No" It was probably very true. We have a doggy door and I just let Braidy (15 months) go outside and back in all day. He LOVES to be outside. Yes, he'll eat some dirt here and there, but it makes him so happy. Unless it's cold, maybe she wants to go play outside! She is adorable and reminds me very much of Braidy...a busy busy baby!!! Haha..we have that same snoring, sleep talking pig. It's odd but funny! My son is the same way. He wants everything he can't have..cell phones, remotes, etc and he freaks out if you take it away or try and give him something else. Very cute pig costume!! Adorable! Such a cute little piggy! My girls had the same costumes - they were the Three Little Pigs. Hope everyone is feeling better at your house! Thank you Kelly, I needed this message today. Glad to hear that ya'll are feeling better. I LOVE the pig costume - that is the cutest thing ever!!! Glad that y'all are feeling better. 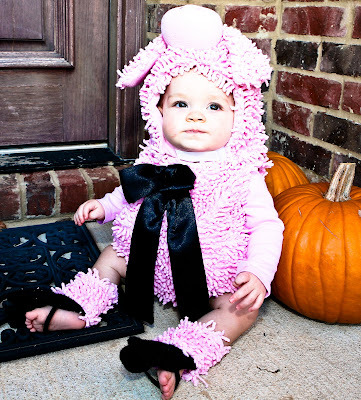 Harper is such a beautiful little piggy...what a great costume!!! And thank you for what you said about God redirecting us, I so needed to read that tonight! Those words were such a blessing for me! THANK YOU! Adorable costume. I LOVE LOVE the pig. We had a pig party for Blair's first birthday, and it turned out so cute. She was a cotton boll for halloween! My MIL made the costume, and it was precious! (there are pictures on my blog of course!) We didn't go trick or treating but she looked so cute. The end of your post was really good. I loved the comparison you made between babies and us as children of God. Thanks for that! Kelly, thanks for the sweet reminder. Oh how I needed that detailed picture of God "redirecting" us or telling us no. I am so struggling with that right now while trying to find a job...I feel like I'm @ at the end of my rope in this search. I just wish I knew what it is He has in store for me or where it is He is trying to direct. I am praying for better days. Thank you SO much for those words Kelly! Loved Harper's pig costume, too cute!! Harper is an adorable pig! I couldn't help but laugh though, that her Halloween costume was a pig and then ya'll got the pig flu! Oh my goodness!!! So super cute! :) Love the costume!! She is the cutest baby and that is the cutest costume ever - really! What an adorable little piggy she is! And what fun Swine Flu get well gifts. Wish I had thought of that when my son had it! Harper looks so big standing tall! Fun times! I find it quite interesting that she was going to be a PIG for Halloween but she couldn't celebrate b/c of the SWINE FLU! LOL! SHE IS SUCH A BEAUTIFUL LITTLE GIRL! Cute as a pig too! I love it that Harper is layering her clothes like her mama!! Too cute!! She is the cutest pig I've ever seen!! I'm so glad you guys are feeling better!! That's the cutest and cleanest little piggy I've ever seen! I had never thought of it that way! thanks for a new perspective! And she looks adorable in that piggy outfit! That's the CUTEST piggie I've ever seen. Do you have pictures of that sweat girl ALL OVER your house? I would! that costume is so cute!!! and i laughed out loud when you said you have to tell her not to go out the doggie door!!! thats gonna be me one of these days!! Now that is just the most darling little piggy I've ever seen! Thanks for that wonderful reminder. I needed to hear that today. I am so, so glad His mercies are new every morning. im not a mother myself but i have done alot of babysitting and one mother i babysat for when he little boy started what Harper is doing and instead of saying no all the time (she was worried he would get discouraged) she would say lets not climb on the table but lets climb on this such as a teddy bear or the sofa something safe! Its a good tip that i have actually seen alot of mothers use but they do grow up fast and she just makes the cutest pig! Pretty precious pig:) Bet she LOVES her new 'hog'. And yes you are so right, if we'd only listen to HIS answers...and obey. Thanking HIM for HIS grace and mercy and thanking you for sharing your heart with us. I am so happy that you two are feeling better!!! Harper is the cutest little pig ever!!! Where on earth did you find that costume?! That has GOT to be the cutest costume I've EVER seen. Where did you get it. I didn't dress my 2.5 month old up. I couldn't find anything I liked, but next year will be different. I'll start early looking for a great costume. Harper is darling and so cute in her piggy costume. Glad she is feeling better! My oldest, who is now 14, was so much like Harper when he was a baby/toddler and into everything he was not supposed to be into. Like Harper, he had so many toys, but was curious about everything else and was very hands-on and wanted to figure out and touched everything he set his eyes on. That curious personality serves them so well when they go to school and in their walk with God, because they are not passive learners, but active. It will be such a blessings, but while they are little, it is absolutely exhausting physically and we, like you guys said "no" when needed and have had to work with him on self-control much more than we had to with our other two kids. I did utilize baby gates, just to keep me sane and keep him safe. Welcome to one of the first of many pictures of us and God you will see with fresh eyes now that you're a mommy. So humbling... Oh what a merciful and gracious God we have! Just found your blog and I'm enjoying it. Your daughter is just precious. What a soft comforting, little pig! Harper looks ADORABLE in that piggy costume! What a cutie! And so true about God guiding us just as we guide our own children. Good reminder. What an adorable piggy! Also what a great way to put it...that is us and God. Isn't it funny how they change every day....such a gift. A gift you do have to work for, but when you lay your head at night at least you can do it with a smile and thank God for all he has blessed us with! Cutest little swine piggy I've ever seen.. Did you tell her how to oink... You must keep this costume for her kids one day.. wonderful. I really enjoyed reading your thoughts about God's gentle and loving redirection...so true! And yes, you have THE cutest little piggy ever! Adorable! And you are so right w/ your anaology of us being parents/guiding our children and having to say no sometimes ...to our relationship with God ...so very very true!! So cute!! I love the stuffed animal and the Halloween costume! It's great! What a cute piggie! My boys were only interested in the remote, and cell phones! Or anything sharp and deadly!! the outfit is killing me! SO cute! I love the little boots- hilarious! I love what you wrote and how you correlated it to how the Lord feels about us! Isn't it amazing how motherhood/parenthood gives you a small glimpse of His infinite love as our Father? What a gift! Also, about Harper getting into things.... i promise it gets easier. 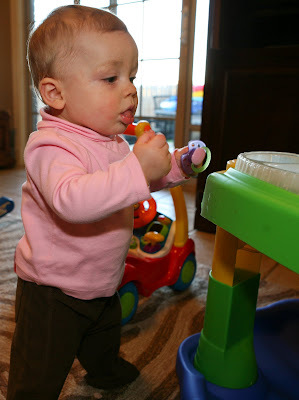 She is right at that age where she is so curious and discovering everything and gaining some independence. Plus, the fact you have been in the house recovering from illness doesn't help :) She is so adorable and it's so fun for all of us to see these huge milestones of your little miracle girl! Happy Thursday! Harper looks soooo cute with her little piggy halloween costume on. 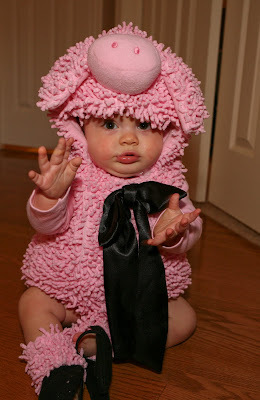 Ok - that little piglet costume is the CUTEST thing I have ever seen!! She is adorable!!! I totally love what you said about God gently re-directing us and how you compared it to the way we tend to our children. That's such a great analogy and it brings it down to "my level" - I really appreciate that and I really needed to hear that! Oh my goodness that is the cutest costume ever. Harper looked so cute in it!!! I love what you said about God always trying to redirect us when not listening to him. You are so great with words and writing. Glad everyone is well again! Here is one of my FAVORITE parenting sites. Lots of info but you won't be sorry spending the time reading it! My goodness - how wonderful that you were able to take a life lesson from having a "mommy moment" and tie it into exactly the message that God wanted me to hear today! Thanks for blessing me! She is the cutest pig I have ever seen! Love the costume! So glad she's feeling better! this is probably the cutest thing i've seen all morning. thanks for sharing! I have mentioned this before, but the more I read about Harper, the more I think she and my little one are twins. Its like you have a camera looking into my house and posting stories about my life! Oh my, she's so cute! I'm so glad that you are both feeling better! kelly, i have been reading your blog since before harper was born and she is such a sweetie. i hardly ever comment since i don't have my own blog yet. but one of my friends posted this on facebook today and i thought u might be interested. i was wondering if u could do a post on it? wouldn't it be wonderful if this little boy got tons of cards?! A friend posted this message and I would like to continue it, my heart goes out to this family. A 5yr old boy is in the last stages of his 2 &1/2 yr battle with Neuroblastoma Cancer, one of his last wishes is to have another Christmas with his family and get Christmas Cards. His family is celebrating Christmas next week for him, so send him a card to: Noah Biorkman, 1141 Fountain View Circle, South Lyon, MI 48178, and past it on! We don't realize how blessed we are to have healthy kids. I believer Harper is the cutest pig I've ever laid eyes on!! When the boys were at this stage, we used to block off each end of the "safe" room with chairs, baby gates, whatever, to keep them corralled. Then I had a confined environment to deal with. She is SUCH a cute little piggy! And you're right - you'll have a walker before you know it. Love your analogy about us as tantrum-throwing toddlers and God as the ever-patient and loving parent...so true! Glad y'all are feeling better!! she is the cutest little pig!!! i love it!! Harper looks precious! I love the piggy costume. It's amazing how fast life can change once they figure out how to get into everything! :) I wouldn't change it for anything in the world. I love every second of it...even the huge messes I clean-up daily! I'm just thankful I am only cleaning-up after one child. Oh my! That is the cutest Halloween outfit I've ever seen! I also wanted to thank you for the wonderful inspirational words. Your blog is such a uniquely comforting read and I truly appreciate that you take the time to do this. She is THE cutest little piggy EVER! I hope you two are feeling better! I think that your Harper and my Ryne have much of the same personality traits. Makes me laugh when I read that Harper is doing the same things as my little guy....and I have a sigh of relief that mine's not the only one trying Mommy's nerves sometimes. It is amazing how much being in the role of a parent can teach us about our relationship with our Heavenly Father. Just wait....it only gets better...mmmm...maybe that is it only gets more convicting....or maybe it only gets more humbling....yet maybe it is just gets more tangible...or the word I'm looking for might just be "real". Well, I think they all apply. Can't even begin to tell you all that God has taught me about our relationship through my two-year old. I just pray that I never stop listening to Him when He chooses to speak through my children! that is such a cute costume!!! That is a great way to look at things when God tells us NO and we dont always listen, does he get frustrated? I love the way you find Great ways to relate small things in life, that i would never think about, in a way we could also relate to God. I need to think more like that. That is the cutest little pig I have ever seen! I love your blog! Glad you are both feeling better! I am sorry you are running around like crazy, I know that must be tough. Avery has changed so quickly at the 5 month mark that I am in for it here in a few short months! Crazy how times flies, right? CUTEST Costume ever! I just love reading your blog and I gave you an award over at my blog! Check it out! OMG she is so cute, she looks adorable. I always love checking your blog for new pictures. Love Harper's pig costume!! Too cute! Have a great rest of your week and weekend! Harper's costume is one of the cutest I've seen this Halloween. I hope you both are feeling better. OMG!!!!!!!!!!! She looks ADORABLE in that costume!!!!!!!! What an ironic costume - but seriously, your little girl gets exponentially cuter everyday! I love Harper's costume! So adorable! 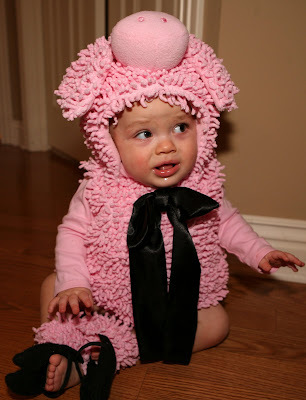 It is seriously one of the cutest baby costumes I have seen! My mom's favorite animal is a pig, so I was one when I was 2. Our preschool did a nativity scene and I was the pig in the manger. There was a penguin, too. Ha! Did you find it funny that missed Halloween because you both had the swine flu...and her Halloween costume was a pig? She was such a cute pig!